Indulge in the elegant beauty of Chocolate by Petite Le Vian. 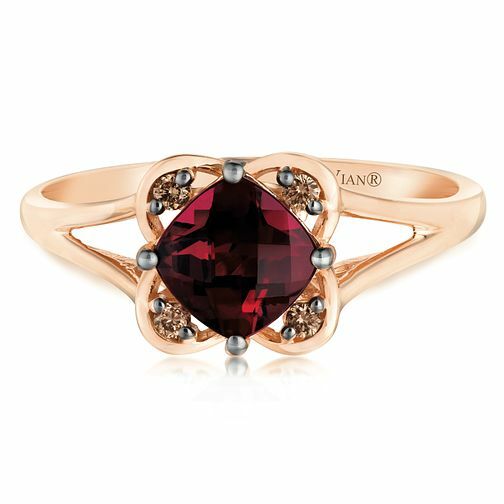 With an angled square Raspberry Rhodolite Pomegranate Garnet at its centre, this stunning ring is crafted from sumptuous 14ct Strawberry Gold and features a floral inspired design set with deliciously dazzling Chocolate Diamonds around the garnet stone for breathtaking beauty and unique, glamorous style. 14ct Strawberry Gold Raspberry Rhodolite & Diamond Ring is rated 5.0 out of 5 by 3. Rated 5 out of 5 by Anonymous from Girlfriend loves it, perfect 21st birthday gift! Perfect gift for my girlfriend's birthday. She couldn't be any more happy, diamonds are beautiful and chocolatey, the gem stone in the middle is large and shiny, amazing! Rated 5 out of 5 by Anonymous from Fantastic eye catcher The photos of this ring really do not do it justice. Amazing ring. Looks gorgeous. Very eye catching. The gemstone Rhodalite also means commitment and devotion which makes it even more special.